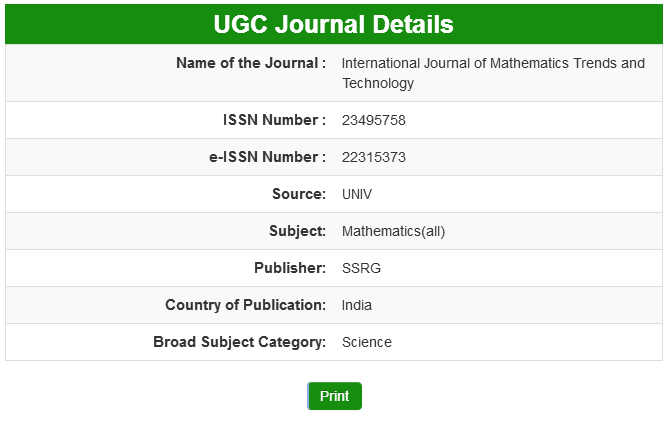 International Journal of Mathematics Trends and Technology – IJMTT is an international, open access journal which provides an advanced forum for studies related to mathematical sciences, aims to publish original research papers and survey articles in all areas of mathematics, enhance the interests, talents, and achievements of all individuals in theoretical mathematics and its applications. The journal publishes high quality articles from all areas of Mathematics and the Mathematical Sciences. The authors are invited to submit "articles with background", presenting a problem of current research with its history and its developments, the current state and possible future directions. The presentation should render the article of interest to a wider audience than just specialists. It devotes exclusively to the publication of high-quality reviews, regular research papers and short communications in all areas of pure and applied mathematics. IJMTT also publishes timely and thorough survey articles on current trends, new theoretical techniques, novel ideas and new mathematical tools in different branches of mathematics. A submission must be well written and of interest to a substantial number of mathematicians and scientists. One of purposes is to reflect the progress of the mathematical research in India and, by providing an international forum, to stimulate its further developments. Subject : Mathematics and science .